Sweeteners: Sorbitol & Sucralose, Magnesium Hydroxide (Pregelatinised Starch), Flavourings: Natural Strawberry Flavour (Maltodextrin, Starch) & Natural Milk Flavour (Maltodextrin, Silicon Dioxide), Flax Seed Oil Powder (Maltodextrin, Starch, Antioxidants: Ascorbyl Palmitate, Ascorbic Acid & Mixed Natural Tocopherol), Vitamin C (Ascorbic Acid [Hydroxypropylmethylcellulose]), Ferrous Fumarate (Mono & Diglycerides of Fatty Acids), Bulking Agent: Maltodextrin, Anti-Caking Agents: Silicon Dioxide, Stearic Acid & Magnesium Stearate, Niacin (Mono & Diglycerides of Fatty Acids, Silicon Dioxide), Colouring: Beetroot Powder (Maltodextrin, Citric Acid), Zinc Oxide (Mono & Diglycerides of Fatty Acids), Vitamin E (D-Alpha Tocopheryl Acid Succinate), Pantothenic Acid (as Calcium Salt), Vitamin D (Maltodextrin, Sucrose, Acacia, Corn Starch, Medium Chain Triglycerides, Antioxidant: DL-Alpha Tocopherol) (from Soya), Vitamin A (Sucrose, Starch, Acacia, Antioxidant: DL-Alpha Tocopherol), Thiamin (Vitamin B1 as Mononitrate), Vitamin B6 (Pyridoxine HCl, Mono & Diglycerides of Fatty Acids), Riboflavin (Corn Starch, Mono & Diglycerides of Fatty Acids), Manganese (Carnauba Wax), Copper (Carnauba Wax), Folic Acid (as Pteroylmonoglutamic Acid), Potassium Iodide, Chromium Trichloride, Sodium Selenite, Biotin, Vitamin B12 (as Cyanocobalamin). Allergy Advice: For allergens, see ingredients in bold. Sweeteners: Xylitol (Carboxymethylcellulose) & Sucralose, Magnesium Hydroxide (Pregelatinised Starch), Flaxseed Oil Powder (Maltodextrin, Starch, Antioxidants: Ascorbyl Palmitate, Ascorbic Acid & Mixed Natural Tocopherol), Flavourings: Natural Lemon (Maltodextrin, Acacia Gum, Sucrose, Glyceryl Triacetate, Citric Acid, Antioxidant: Alpha Tocopherol), Raspberry (Maltodextrin, Monopropylene Glycol, Gum Acacia), Strawberry & Apple, Vitamin C (Ascorbic Acid [Hydroxypropylmethylcellulose & Tartaric acid]), Bulking Agent: Maltodextrin, Ferrous Fumarate (Mono & Diglycerides of Fatty Acids), Anti-Caking Agents: Silicon Dioxide, Stearic Acid & Magnesium Stearate, Niacin (Nicotinamide [Mono & Diglycerides of Fatty Acids, Silicon Dioxide]), Citric Acid, Beetroot Powder (Maltodextrin), Zinc Oxide (Mono & Diglycerides of Fatty Acids), Vitamin E (D-Alpha Tocopheryl Acid Succinate) (from Soya), Pantothenic Acid (as Calcium Salt), Vitamin D (Cholecalciferol [Acacia, Sucrose, Maltodextrin, Corn Starch, Medium Chain Triglycerides, Antioxidant: DL-Alpha Tocopherol]), Vitamin A (as Acetate [Gum Acacia, Starch, Sucrose, Tricalcium Phosphate, Antioxidant: DL-Alpha Tocopherol]), Thiamin (Vitamin B1 as Mononitrate, Mono & Diglycerides of Fatty Acids), Vitamin B6 (Pyridoxine HCl, Mono & Diglycerides of Fatty Acids), Riboflavin (Mono & Diglycerides of Fatty Acids, Corn Starch), Manganese Sulphate (Carnauba Wax), Copper Sulphate (Carnauba Wax), Folic Acid (as Pteroylmonoglutamic Acid), Potassium Iodide, Chromium Trichloride, Sodium Selenite, Biotin, Vitamin B12 (as Cyanocobalamin). Allergy Advice: For allergens, see ingredients in bold. FOOD SUPPLEMENT with sweeteners. Food supplements must not replace a varied and balanced diet and a healthy lifestyle. As with other food supplements, consult your doctor or pharmacist before giving to your child if they are under medical supervision, have epilepsy, a thyroid condition, haemochromatosis, suffer from food allergies, or are allergic to any of the ingredients. Excessive consumption may produce laxative effects. This product contains iron, which if taken in excess, may be harmful to very young children. 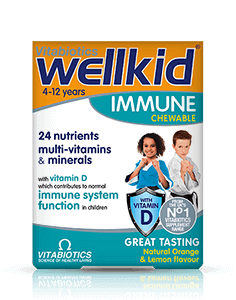 How many tablets does one pack of Wellkid Smart Chewable contain? How and when should Wellkid Smart Chewable be taken? 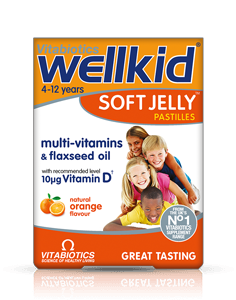 Are there any undesired effects whilst taking Wellkid Smart Chewable? 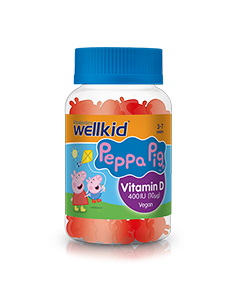 Is Wellkid Smart Chewable recommended with any other Vitabiotics products? Is Wellkid Smart Chewable suitable for vegetarians? Is Wellkid Smart Chewable kind to teeth? Has Wellkid Smart Chewable been tested on animals? Government surveys have indicated that children’s diets can sometimes be low in certain nutrients such as iron, vitamin A and vitamin D. Many children are also not eating the recommended 5 portions of fruit and vegetables a day and so may not be getting all of the vital nutrients that their bodies need for long term health and development. Some foods may have a lower than expected nutritional content and be low in certain micronutrients as a result of several factors including modern farming practices, the lengthy storage of 'fresh’ food before it is sold in some shops and over cooking which can cause certain nutrients to breakdown. It is important to promote a healthy diet and lifestyle in children and encourage positive eating and exercise habits for later in life. Food supplements are of course not a substitute for a healthy balanced diet! 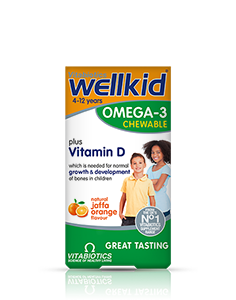 Wellkid Smart Chewable contains 30 one-a-day chewable tablets per pack. Suitable for children aged 4-12 years old. Chew one Wellkid Smart Chewable daily preferably with a main meal. These tablets have not been designed to be swallowed whole. 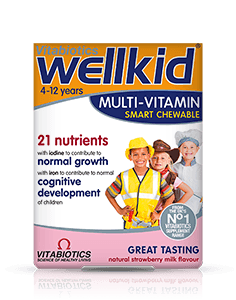 Wellkid Smart Chewable should not be given to children under the age of 4. It is important to ensure that your child does not take more than the recommended amount. 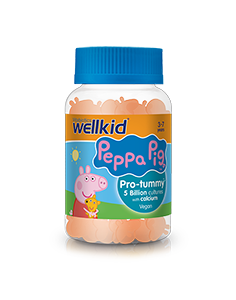 Wellkid Smart Chewable have no known side-effects when taken as directed. Do not exceed the recommended daily intake. In case of overdose, seek medical advice immediately. As with all supplements, seek professional advice before using if your child is under medical supervision or suffers from any food allergies. 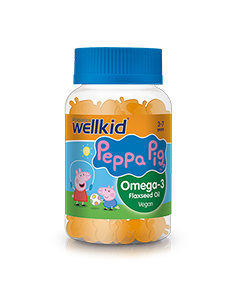 Wellkid Smart Chewable contains tooth friendly sweeteners, which if taken in excess may have a laxative effect. Calcium is needed for normal growth and development of bone in children. 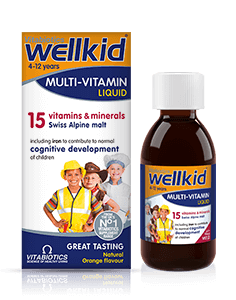 However, it has not been included in the Wellkid Smart Chewable formula, as it is not possible to include the right amount in one tablet. 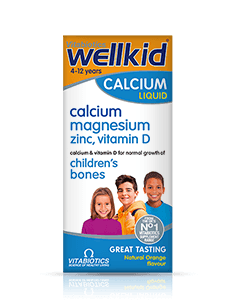 Rather than including just a token amount of calcium, Wellkid Smart Chewable has been designed so that it can be taken alongside Wellkid Calcium Liquid. Yes. Wellkid Smart Chewable is suitable for vegetarians. Wellkid Smart Chewable contains xylitol, a special kind of sugar that is kind to teeth. No. 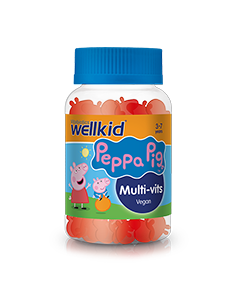 Like all other products in the Vitabiotics range Wellkid Smart Chewable has not been tested on animals.